A rhetorical device uses words in a certain way to convey meaning or to persuade. It can also be a technique used to evoke emotion on the part of the reader or audience. Skilled writers use many different types of rhetorical devices in their work to achieve specific effects. Some types of rhetorical devices can also be considered figurative language because they depend on a non-literal usage of certain words or phrases. Alliteration refers to the recurrence of initial consonant sounds. The phrase "rubber baby buggy bumpers" is one example you might remember from your childhood. Alliteration is often associated with tongue twisters for kids, but brand names commonly use this technique too, such as American Apparel, Best Buy, and Krispy Kreme. Allusion is a reference to an event, place, or person. For example, you might say, "I can't get changed that quickly, I'm not Superman!" Referring to something well known allows the writer to make a point without elaborating in great detail. Amplification repeats a word or expression for emphasis, often using additional adjectives to clarify the meaning. "Love, real love, takes time" is an example of amplification because the author is using the phrase "real love" to distinguish his feelings from love that is merely infatuation. An analogy explains one thing in terms of another to highlight the ways in which they are alike. "He's as flaky as a snowstorm" would be one example of an analogy. Analogies that are very well known are sometimes called idioms or figures of speech. Anaphora repeats a word or phrase in successive phrases. "If you prick us, do we not bleed? If you tickle us, do we not laugh?" is an example from Shakespeare's Merchant of Venice. The use of anaphora creates parallelism and rhythm, which is why this technique is often associated with music and poetry. However, any form of written work can benefit from this rhetorical device. Antanagoge places a criticism and compliment together to lessen the impact. "The car is not pretty, but it runs great" would be one example because you're referring to the vehicle's performance as a reason to excuse its unattractive appearance. Antimetabole repeats words or phrases in reverse order. The famous John F. Kennedy quote, "Ask not what your country can do for you - ask what you can do for your country" is a well-known example. Antiphrasis uses a word with an opposite meaning for ironic or humorous effect. "We named our Chihuahua Goliath" is an example because a Chihuahua is a very small dog and Goliath is a giant warrior from the famous Bible story. Antithesis makes a connection between two things. Neil Armstrong said, "That's one small step for a man, one giant leap for mankind." This pairs the idea of one man's individual action with the greater implication for humanity as a whole. An appositive places a noun or noun phrase next to another noun for descriptive purposes. An example would be, "Mary, queen of the land, hosted the ball." In this phrase, "queen of the land" is the appositive noun that describes Mary's role. Enumeratio makes a point with details. For example, saying "The renovation included a new spa, tennis court, pool, and lounge" uses specific details to describe how large the renovation was. Epanalepsis repeats something from the beginning of a clause or sentence at the end. Consider the Walmart slogan, "Always Low Prices. Always." The repeated words act as bookends, driving the point home. An epithet is a descriptive word or phrase expressing a quality of the person or thing, such as calling King Richard I "Richard the Lionheart." Contemporary usage often denotes an abusive or derogatory term describing race, gender, sexual orientation, or other characteristics of a minority group. Epizeuxis repeats one word for emphasis. 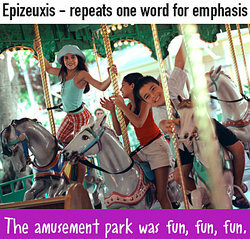 A child who says, "The amusement park was fun, fun, fun" is using epizeuxis to convey what a wonderful time he had at the park. Hyperbole refers to an exaggeration. Saying "I have done this a thousand times" to indicate that you're very familiar with a task is an example of hyperbole because it is unlikely you've really performed the task a thousand times. Litotes make an understatement by using a negative to emphasize a positive. In this rhetorical device, a double negative is often used for effect. So saying someone is "not a bad singer" actually means you enjoyed hearing them sing. Metanoia corrects or qualifies a statement. "You are the most beautiful woman in this town, nay the entire world" is an example of metanoia because the speaker is further clarifying the extent of the woman's beauty. A metaphor is a type of implied comparison that compares two things by stating one is the other. "The eyes are the windows of the soul" means you "see" someone's emotional state by looking into their expressive eyes-eyes are not literally windows. Metonymy is a type of metaphor where something being compared is referred to by something closely associated with it. For example, writers often refer to the "power of the pen" to convey the idea that the written word can inspire, educate, and inform. A pen has no power as an inanimate object, but the writer's words can reach a broad audience. Onomatopoeia refers to words that imitate the sound they describe, such as "plunk," "whiz," or "pop." This type of figurative language is often used in poetry because it conveys specific images to the reader based on universal experiences. We are all familiar with the "squeal" of tires as a vehicle stops abruptly or the "jingle" of car keys in your pocket. An oxymoron creates a two-word paradox-such as "near miss" or "seriously funny." An oxymoron is sometimes called a contradiction in terms and is most often used for dramatic effect. Parallelism uses words or phrases with a similar structure. "Like father, like son" is an example of a popular phrase demonstrating parallelism. This technique creates symmetry and balance in your writing. A simile compares one object to another. "He smokes like a chimney" is one example. Similes are often confused with metaphors, but the main difference is that a simile uses "like" or "as" to make a comparison and a metaphor simply states the comparison. An understatement makes an idea less important than it really is. "The hurricane disrupted traffic a little" would be an understatement because hurricanes cause millions of dollars in damage and can lead to injuries or fatalities. Now you see how these different examples of rhetorical devices work, you can use rhetorical devices in your own writing or speeches to create more interesting or persuasive content that sticks in the mind. "Examples of Rhetorical Devices." YourDictionary, n.d. Web. 18 April 2019. <https://examples.yourdictionary.com/examples-of-rhetorical-devices.html>.